Kabuki portraits by the one of the most popular, prolific and financially successful artists of woodblock prints in 19th century Japan, Utagawa Kunisada, will be featured in the exhibition Utagawa Kunisada (1786-1865) Japanese Kabuki Portraits from the Art Museum Collection. Kunisada was renowned during his own lifetime for his ukiyo-e prints and his reputation exceeded that of his contemporaries, including Hokusai, Hiroshige and Kuniyoshi. Ukiyo-e, or literally translated “the floating world,” refers to an impermanent world of fleeting beauty and a realm of entertainers, such a kabuki, which are divorced from the responsibilities of the mundane, everyday world. Kunisada’s yakusha-e, or kabuki actor portraits, first appeared in 1808 and became his main subject matter. The yakusha-e prints vary greatly; some depict the actors very generically, showing simply an actor playing a role while others show actors in elaborate scenes that intentionally obscure the distinction between the play and actual events. 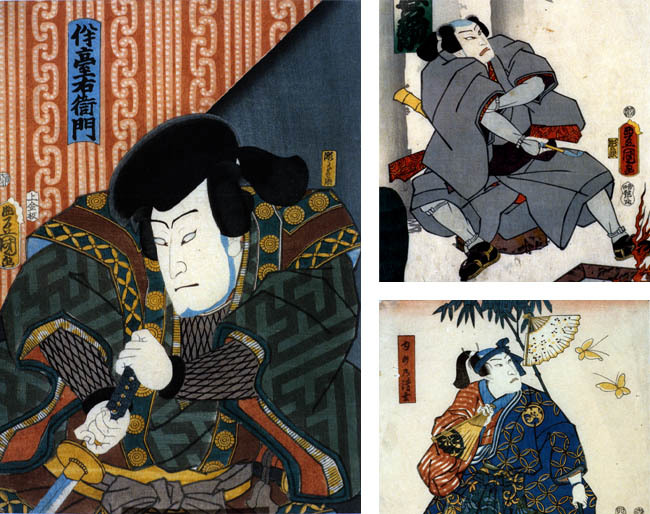 Kunisada is well known for his style of creating highly characteristic depictions of the actors, which while not particularly realistic, are highly individualized. Kunisada's productivity was extraordinary as it is estimated he produced between 20,000 to 25,000 designs for woodblock prints during his lifetime. Without artists like Kunisada kabuki actors might only be known by name to modern scholarship without visual record.